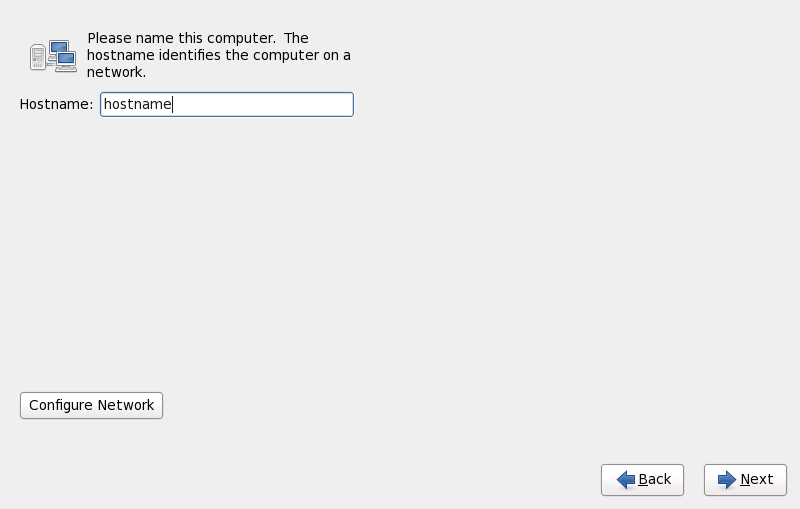 Change the default setting localhost.localdomain to a unique hostname for each of your Linux instances. 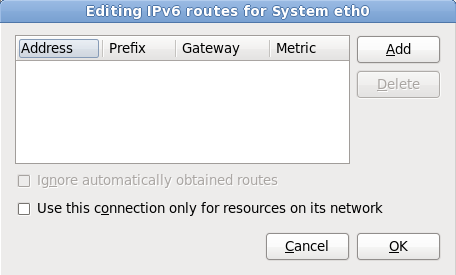 Usually, the network connection configured earlier in installation phase 1 does not need to be modified during the rest of the installation. You cannot add a new connection on System z because the network subchannels need to be grouped and set online beforehand, and this is currently only done in installation phase 1. 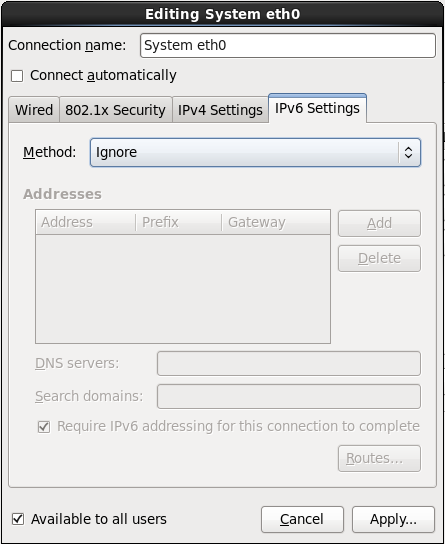 To change the existing network connection, click the button Configure Network. 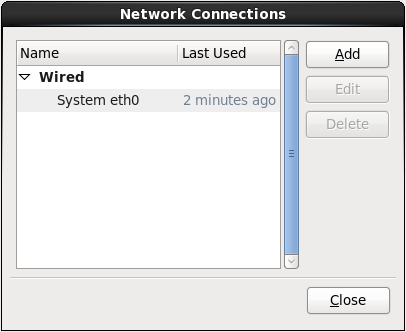 The Network Connections dialog appears that allows you to configure network connections for the system, not all of which are relevant to System z. All network connections on System z are listed in the Wired tab. 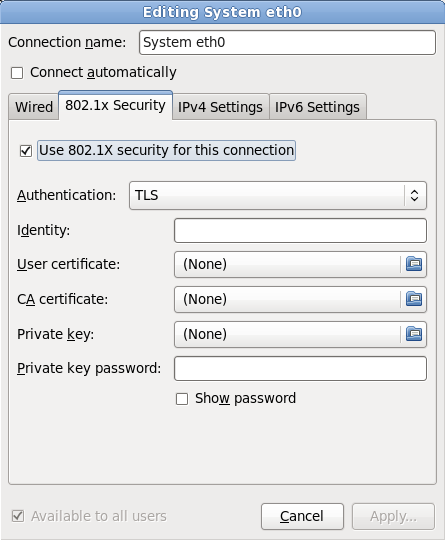 By default this contains the connection configured earlier in installation phase 1 and is either eth0 (OSA, LCS), or hsi0 (HiperSockets). Note that on System z you cannot add a new connection here. 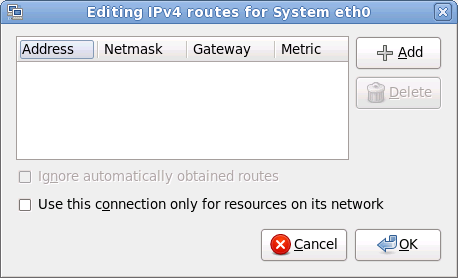 To modify an existing connection, select a row in the list and click the Edit button. 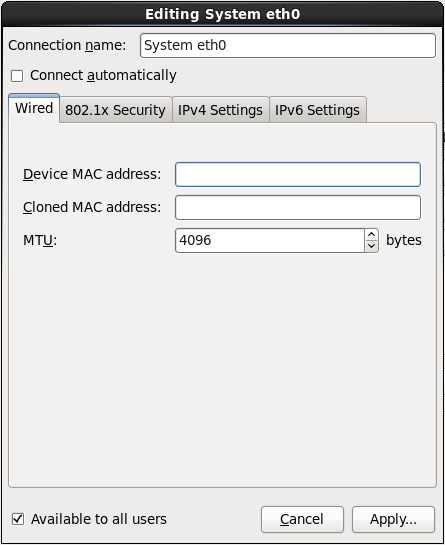 A dialog box appears with a set of tabs appropriate to wired connections, as described below. The most important tabs on System z are Wired and IPv4 Settings. 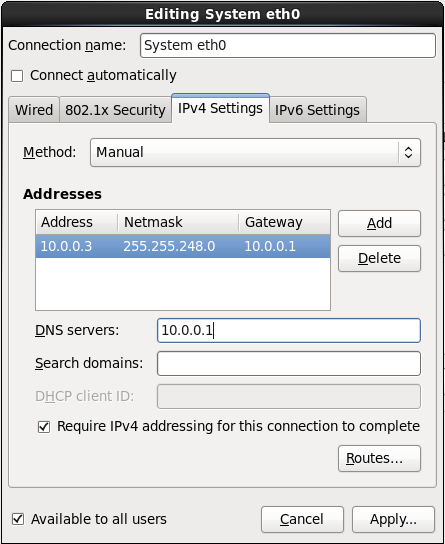 The address, netmask, gateway, DNS servers and DNS search suffix for an IPv4 connection were configured during installation phase 1 or reflect the following parameters in the parameter file or configuration file: IPADDR, NETMASK, GATEWAY, DNS, SEARCHDNS (Refer to Section 26.3, “Installation Network Parameters”).